Regardless of how disturbing Roberts's viewpoints may be, it's impossible for this American to understand how on earth that gives any government the right to "disappear" him and threaten those wishing to publicly discuss the issues that led to his arrests. This shameful episode has reminded me that, as bad as things are in the US, at least I live in a land where free speech is still (more-or-less) enshrined as one of the nation's cornerstones. I can't imagine what it must be like to live in a country without strong First Amendment rights. 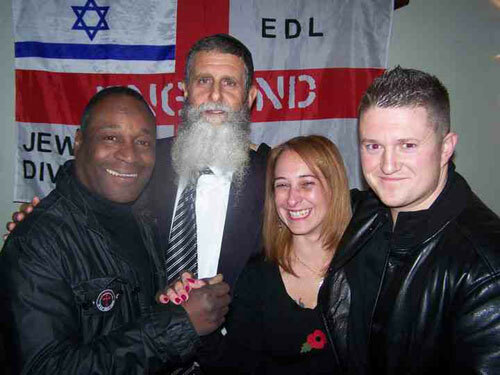 Here is a podcast which talks more about Tommy Robinson. Although I’m no fan of his, I am disturbed by a lot of what is going on at the moment. And it’s far from the right that’s affected, there are academics and left wing commentators that are being suppressed. I don't think such a tyrannical movement would even be phased by such a threat. Vietnam was 50 years ago. Technology has moved those goalposts and will continue to do so. I don't think such a tyrannical movement would even be phased by such a threat. By not being part of the "American Gun Community", you have no clear understanding of what that threat actually consists of, and thus it's probability of success or failure. Dr. Greg Johnson - "Why I don't support Tommy Robinson"
Here is an interesting analysis by the actual Vietnam veteran whether the similar guerilla-style warfare is possible in the USA, as a means of a full-blown armed revolution. In short, his answer is: it is possible, and may even be successful - but only if the large part of the population would actively support it. By not being part of the "American Gun Community", you have no clear understanding of what that threat actually consists of, and thus it's probability of success for failure. Sure I do. If you have something substantive to add on the matter, add it. Otherwise, save the dismissive one liners for your beer buddies. My opinion... there are too many unknowns to say outright whether an armed revolution would be successful... also we have to define what "success" would look like. I don't think there's any way the USA would still be composed of all 50 states on the other side of such a civil war. It would be fragmented. The most essential element of success would be a coherent and widely believed narrative that cemented the perception of the Feds as evil tyrants in the minds of a large percentage if not the majority of Americans (including by many in the military). A new cohesive group identity with the obvious moral high-ground would have to be formed and believed in and I don't see this as being all that likely in the current situation. There would have to be a major disaster disrupting utilities, an outside enemy, a common narrative, a new cohesive identity, and open communication channels to support such a rebellion. And since the largest military and military intelligence services in the world have been in the business of regime change for a hundred years or more, they know all this and know exactly how to get a handle on the situation, so unless there was some kind of successful preemptive decapitation strike that caught the rats outside of their holes and allowed natural selection to take its course for a few decades, then I think the rebels have little chance of doing anything more than breaking up America into pieces and giving the post-crisis government(s) a convenient scapegoat with more reasons to take away guns and freedoms. Well, the guy who published the article on his web portal - the pan-anarchist and pan-secessionist Keith Preston - is hoping exactly for this scenario. What he dreams about is the split and fragmentation of the USA into many smaller states, that, in his opinion, can be realtively easily broken and shattered further, to the ultimate condition of countless small autonomous stateless communities (which would be an anarchy that he desires). In my business I speak with Cops, working men, Veterans, and active Military Members every day. We are the American Gun Community who own the majority of those millions of guns. We are also the people who drive around in service trucks and sit in data centers maintaining your utilities, communications networks, and food transportation. I don't share your faith in the ability of talking heads in penthouses in New York and D.C. to order around millions of armed people. People with the views like yours, Charlie, can also be - and often are - genuine revolutionaries. Yet their revolutions are reactionary, not progressive - instead of liberty, equality and fraternity, they intend to bring harsh and opressive order, rigid hierarchy, social segregation and exclusion. So wait. The broad ownership of semi-automatic weapons by everyday citizens is or is not the linchpin keeping the state at bay? Yep. Any successful resistance would rely on the state losing control of the military. This has played out over and over through history. Sure, it used to be a melting pot. Now we seem to follow the tossed salad model. Yet their revolutions are reactionary, not progressive - instead of liberty, equality and fraternity, they intend to bring harsh and opressive order, rigid hierarchy, social segregation and exclusion. You say that like it's a bad thing. See my post above here. The only viable cure for late-stage Marxism is Fascism. If you know of a better way to stop Marxists from murdering hundreds of millions of innocent people like they did in the 20th century, I'm all ears.